Industries in every sector are feeling the pressure to reduce their impact on the environment. This pressure is coming for North American manufacturers. This pressure is not only coming from investors and customers but also from government regulations. These regulations place new demands on manufacturers to track the impact their operations and products have on the environment, specifically at the end of the products lifecycle. 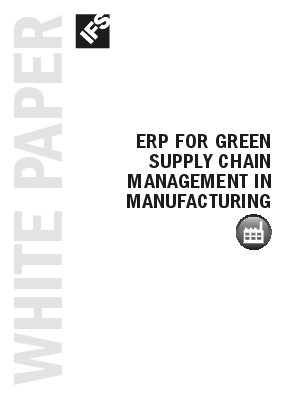 This whitepaper addresses the various drivers for the green supply chain trend, shares important considerations for satisfying a green supply chain initiative of a customer or initiating your own green supply chain initiative, and discusses the role of enterprise software like enterprise resources planning (ERP) in keeping pace with this industry trend.